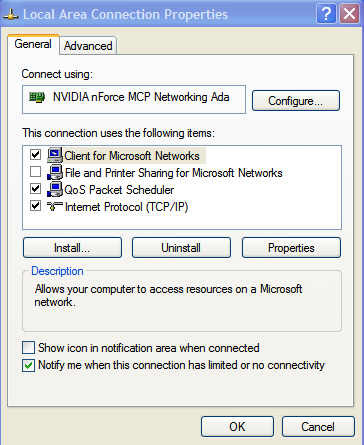 This is a screen shot of XP Network Connections Utility. You go to the Control Panel and click on the Network Connections Icon, then right click on the adapter you are using and go to Properties. That should bring up this Utility. The main thing you want to do is Uncheck File and Printer Sharing, unless you know that you are and want, other computers to connect to your computer. If you are unsure, uncheck it, to be safe. This is on, by default, in XP. If you need someone to connect to your files or printer, then you will have to leave it on. Look over this MS support page on file sharing Simple File Sharing. You will want to know this information, if you keep file sharing on or need to reactivate it. You can also turn file sharing off in XP Professional, by going to Start-My Computer-Tools-Folder Options-View tab, scroll down to the last entry Use Simple File Sharing and uncheck it. This is also where you configure the different clients for your internet connection. You can add one or remove one by highlighting it and choosing the appropriate button. If you use the Internet Connection Wizard, it will configure this for you. Also most ISP will give you a, install CD, that will set this up for you. Some people will tweak some of the properties of their adapter to get more speed, but you would have to do a search of your particular adapter to find out what tweaks would be of help. The Advanced Tab, is for your XP Firewall Settings, you can also reach those in the Control Panel, the Firewall Icon. There is also a link to the Network Setup Wizard on the Advanced page. Also if you right click on your Local Area Connection and choose Status-Support tab, that is where you can find your IP Address, Subnet and Default Gateway information. The first Status screen shows packets sent and received.